Philip Greene gives himself a tall order, then, using cocktails as a prism through which to view Hemingway’s life and work. But he’s clearly the man for the job: a lifelong admirer of Papa’s prose, Greene is not just one of the founders of the Museum of the American Cocktail but a descendant of Antoine Peychaud, creator of the legendary bitters. 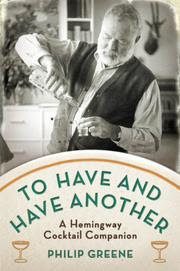 To Have and Have Another: A Hemingway Cocktail Companion features meticulous scholarship. Greene ably debunks the legend of Hemingway’s supposed affection for the mojito; suggests that the Jack Rose the author drank in Paris was a far more complex drink bearing a resemblance to the Bronx cocktail; and even unearths a Hemingway original from Papa’s medical files, complete with diagram. Hemingway often comes across as more a stubborn drinker than an accomplished one, insisting on his own idiosyncratic preparation of the martini and bringing his own personal barman to parties. Inspired, I made the last drink featured in Greene’s book. “The White Lady is a delightful cocktail that, I boldly predict, will soon enjoy a renaissance,” he writes, and I hope he’s correct. The drink can be traced back to both the famous cocktail Harrys, McElhone of Harry’s New York Bar in Paris and Craddock of London’s Savoy; Greene astutely draws a parallel between the exodus of artists and craft bartenders to Europe in the 1920s. I didn’t use Greene’s recipe, but a modified one from The PDT Cocktail Book by Jim Meehan. Hemingway wouldn’t have cared for this version because it includes simple syrup, and he didn’t take sugar as his favorite daiquiri would indicate. I opted to include the egg white, which gives the drink a beguiling silky texture. Feel free to omit it. Shake ingredients without ice if using egg white, then with ice. Strain. No garnish.